It was one of those easy, perfect Sundays. 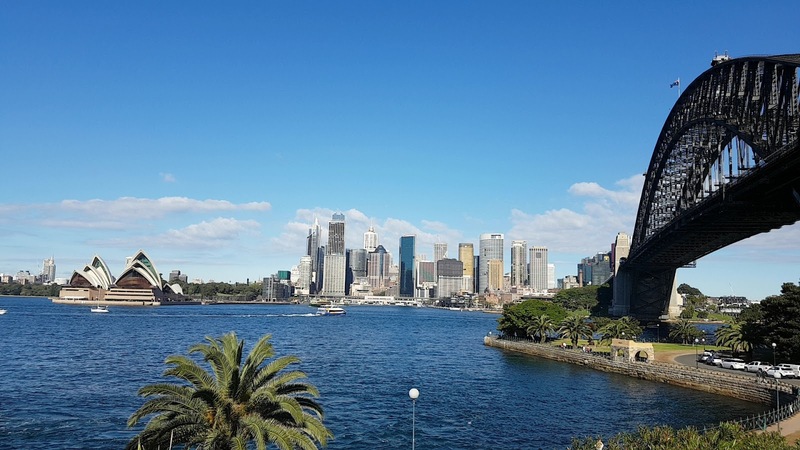 I cruised to Kirribilli, navigating the typically annoying streets of Sydney with no traffic or hassle. I arrived on time at 9am and found a free park right near Celsius Coffee Co (for those of you who are familiar with the area, you know this is no easy feat). I met my cousin and after some confusion we found the café tucked in the corner of the wharf. We were told we could sit right away at a shared table or put our names down and wait for our own table, we decided to wait and take the opportunity to walk down the wharf and look at view of the glittering blue water on a blue, warm winters day. By the time we had finished and walked back to the café, our names was called. I told you- it was an easy, perfect Sunday. Our little table was at the back of the restaurant and had a stunning view of the water. It was like being on a boat but without the sea sickness! 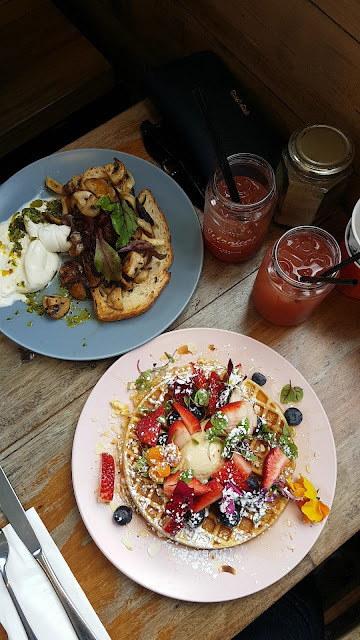 After looking at the menu, my cousin and I narrowed it down to the Burrata & Mushrooms (Sautéed oyster, shitake and white mushrooms, local Burrata cheese, chimichurri on sourdough) and the Celsius waffle (served with berries, maple syrup, toasted nuts and peanut butter cream) to share between us. Both were priced at $19. We each got the watermelon, apple and lemon juice at $7.50 each. 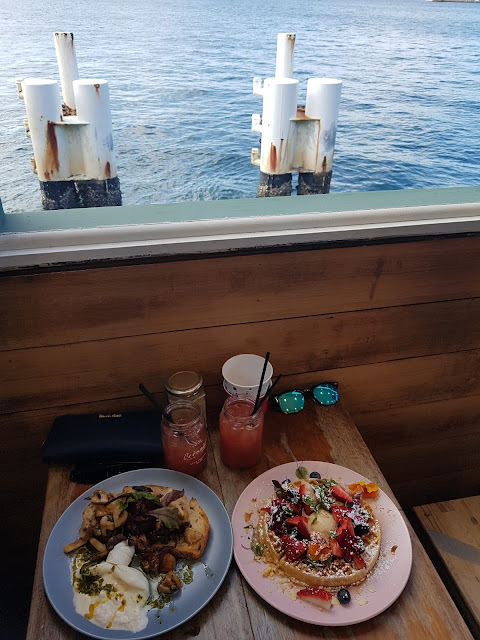 Because of our cosy location in the back of the restaurant and the views, it was such a relaxing breakfast spot and it was nice not to see the growing queue outside as you tend to see when dining at a popular brunch spot on the weekend. Our juices arrived first and although they were nice, it seemed a bit overpriced for the amount of juice you got. It wasn’t too long until our mains arrived. We first dug into the mushroom and burratta. I’ve never had burratta before (in case you like me haven’t heard of it, its an Italian cheese made from cream and mozzarella) but it tasted delicious with the mushrooms. And those mushrooms! So delicious! Perfectly sautéed in a tasty seasoning. We then dug into the waffles, which were nice but it was the peanut butter cream that made it that something special. Without the peanut butter cream, I would say it was just an average dish- nothing bad, but nothing amazing. We were glad we decided to share the two dishes as we got to try both the savoury and sweet and it was the perfect amount for the two of us. We left content, which quickly turned to relief as we saw that the café now had a massive line out the café, up the stairs and onto the street! I later read on Instagram that people had waited 2 hours for breakfast! So a hot tip is to get there around 9 (or before!) to get a spot fairly quickly. My other tip would be to get the mushroom burratta- yum! Overall, I would highly recommend the café. It’s in a beautiful spot and the food was delicious and had elements you probably haven’t seen before.